Making pillow covers is a fun way to decorate a room. The beauty of pillow covers is that they can easily be changed out to match the seasons. Covering an older pillow hides its age and wear. Creating them is easy. A trip to the fabric store will offer lots of ideas for patterns and colors. 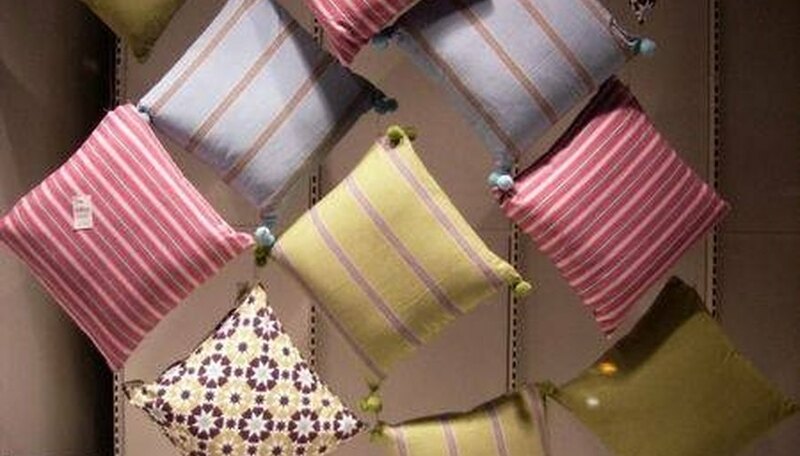 There are even ways to create beautiful pillow covers without sewing. Measure the pillow to be covered with the measuring tape. Take measurements of length, width and thickness. Figure out the amount of fabric required to cover the pillow. To the length, add 8 inches, plus the thickness of the pillow. To the width add 5 inches, plus the thickness of the pillow. This is the amount for the top piece of the pillow. Double these measurements, as two pieces are needed. Most fabric comes in 42-inch or 54-inch widths. Here are the measurements needed to cover a 24 inch long by 10 inch wide pillow that is 2 inches thick. Length is 24 + 8 + 2 = 34 inches. Width is 10 + 5 + 2 = 17 inches. Two pieces are required, each 34 inches long by 17 inches wide. One yard of 42-inch wide fabric is required to make this pillow. Prewash the fabric. Press to remove wrinkles. Remove selvage edge and mark the fabric's bias edge. This is the edge opposite the selvage edge. It is the edge with the most stretch to it. Mark the fabric for the bottom piece. For the bottom piece, mark and cut according to the measurements. Make a mark on the right side of the fabric 2 1/2 inches in from the edges. Cut the bottom piece in half. Mark the fabric 1 1/2 inches in from the cut edge. Mark and cut the fabric for the top piece. The top piece should be should be 3 inches shorter in length than the bottom piece. Assemble the pillow cover. On the two bottom pieces, turn under the cut edge toward the wrong side of the fabric to meet the mark. Press to hold. Stitch in place, close to the mark. Lay the top piece of the pillow cover right side up. Lay the two bottom pieces on top of the top piece, right sides down. The two bottom pieces should overlap by 1 1/2 inches. Pin everything in place. Sew the pillow cover. Sew along all of the outer edges, allowing for a 1/2-inch seam allowance. Trim seams to 1/4 inch with pinking shears. Press seams open using the iron. Turn the pillow cover so the right sides are facing out. Do this through the opening in the back. Following the mark made earlier, top stitch around the marking, making a decorative flange. Trim all loose threads. Press if necessary. Insert pillow. Use decorative thread to add a special touch. Use a press cloth when ironing delicate fabrics to prevent scorching.